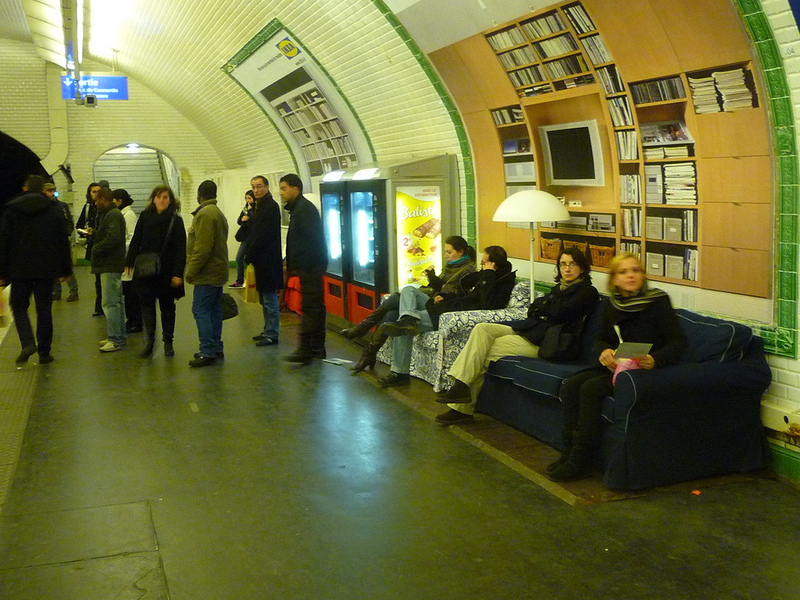 Transit riders relax in a living Ikea ad in the Paris Metro. Source: pterjan. On Monday, despite a two-week delay, violent opposition, vandalism and a minibus taxi strike, Johannesburg successfully rolled out new Rea Vaya bus rapid transit routes in the Soweto township. Secretary of Transportation Ray LaHood announced the new Policy Statement on Bicycle and Pedestrian Accommodation Regulations and Recommendations, an emphatic statement of support for prioritizing biking and walking in transportation planning. President Obama signed the jobs bill – which includes a highway trust fund infusion of $20 billion – into law. The District of Columbia Department of Transportation shared plans to build a bike lane on one of America’s most legendary streets, Pennsylvania Avenue, as well as several other major corridors. Occidental College hosted Los Angeles’ first Street Summit, where advocates and professionals discussed how to make the auto-oriented city more livable and sustainable. In a controversial move, school officials turn to school bus ads to raise money. St. Patrick’s Day (March 17) was also Transportation Freedom Day in Texas: the day by which the average Dallas household had earned enough to pay for a year’s worth of transportation costs. The Brookings Institution released the fourth installment of its Metro Monitor series, revealing nascent signs of economic recovery, but also a “double-dip” recession that may further hurt metropolitan areas continuing to suffer effects from the downturn. New research finds that “CO2 domes” that form over cities can have serious local impacts such as worsening the effects of localized air pollutants like ozone and particulates. The auto industry aligned with the White House in the debate over a congressional bid to block the Environmental Protection Agency (EPA) from regulating carbon emissions, warning that such an attempt to co-opt EPA authority “would collapse” last year’s agreement to raise fuel-efficiency standards. Ikea is displaying its furniture collections this week in the Paris Metro. Good documents the conversion of one of San Francisco’s freeways, damaged in the Loma Prieta earthquake, into an urban farm. Toronto’s new Sherbourne Park plays a dual role as a storm water treatment facility and a public park. California’s Clean Vehicle Rebate Program launched, giving battery electric vehicle or plug-in hybrid buyers a rebate of up to $5,000. BMW and Siemens unveiled a system of networked traffic lights that can communicate with nearby cars to warn them about road conditions, receive information about traffic patterns and adjust timing to optimize traffic flow, saving time and fuel. Grist runs a five-part series on the electric bike.